Staff - J A Y A D E V I Arts Inc. - "Preserving IndoCaribbean Arts & Culture"
Denyse spent 16 year with Rajkumari Center for Indo-Caribbean Arts & Culture where she continued her Kathak training with Gora Singh and was taught the dying art form of Rajdhar. At Rajkumari Denyse trained in Drama, stage managing, technical lighting, producing, directing, and other fields of theater.She was the Secretary of Rajkumari and the Director of Operations for a few years. Ramona Singh and Teshrie Kalicharran introduced the south indian style to her and gave her knowledge in mudras, abhinayas, bhavas, and choreography techniques. Denyse have had the pleasure of performed with Ramona Singh, Teshrie, Ramona, & Romanee Kalicharran, Mohini & DevikaTajeshwar, Taij Kumari Moteelal, Lakshmee, Pritha, & Radha Singh, Something Positive, Shivanna Jorawar, and many Caribbean artists. Denyse attend Borough of Manhattan Community College majored in Business and minored in Vocal. She was a member of the Dance club and received training in West African and modern dance. Presently she is pursuing her Master's degree in non profit. Ramona Devi Singh i She studied Bharata Natyam and Kuchipudi dance styles extensively under the late “Sudarkodi” Padma Ramanathan, with Raja Rajeshwari at the Padmalaya Dance Academy. 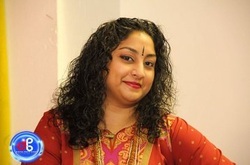 In 2002, she began working with the Rajkumari Cultural Center, appearing in their annual Kitchrie festivals and theater productions, and studied Indo-Caribbean music and dance traditions – Tan Sangeet Music/Rajdhar Dance, Baithak Ki Gana Music/Lounda Ki Nauch Dance, and Mariemmen Music and Dance Theater with custodians from Guyana, Trinidad and Suriname. She studied traditional Women Songs with Smt. Bhagmatti Ragubir and Seorie Autar. In 2004 she began studying Kathak with Romanee R. Kalicharran. Ramona’s wider artistic abilities and interests include classical and ghazal singing which she studied under Kinnar and Payal Seen. Mohini is a graduate student at the East West School of Dance, founded by Shri Brahmananda Sarasvati (Ramamurti S. Mishra M.D.) of the Ananda Ashram in Monroe New York. She studied under Pandit Satya Narayana Charka, distinguished Kathak dancer, internationally acclaimed Choreographer, and performer. Mohini also collaborated with Shri Brahmananda Sarasvasti. In 2010 she successfully completed her degree in Kathak Dance under the syllabus of International Schools of East-West Unity (Gurukula) Inc. Mohini recently graduated from Berkeley College with an A.S.S in Fashion Marketing and Management and currently pursuing a Pyschology Degree at Hunter College CUNY; interdisciplinary with Physical Therapy.